The other day I was going all KonMari on my daughter as I was helping her organize and tidy her den. (So proud of kiddo - six big garbage bags of things left their home!) 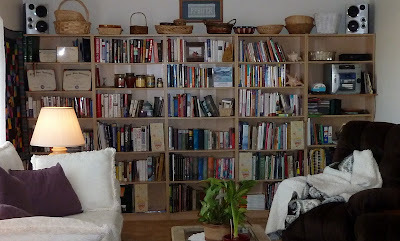 As I was working with her as she culled her books, it occurred to me I had forgotten about some books at my own home. But I forgot about all my kids books and teaching materials. When I left the classroom years ago I got rid of hundreds and hundreds of books. But I kept a couple containers of books and materials. Things I thought would come in handy someday when I had grandkids. Well, no grandkids yet. And a realization that even if and when grandkids arrive, I really didn't need everything I had kept. So the other night after hubby had gone to bed I went through the closet and the containers. I did keep a few things (can't get rid of that set of Dr. Seuss books - that's an order from my daughter), but I can happily report today's Friday 15 is actually a Friday 101. Yep, 101 books and materials that had been important to me over the last 30 years will no longer be mine. I just noticed something about the picture. Since less stuff = simpler life = more free time it seems pretty ironic that the last book I put in the stack was Teacher Tested Timesavers.